If you are looking for a natural, refreshing and healthy drink, then you might like to try coconut water to quench your thirst. Coconut water is the most popular drink consumed in tropical countries and it is not only considered as a refreshing drink but also a health tonic. A cup of coconut water contains about 46 calories compared to coconut milk that has 550 calories. The water is very hydrating, contains natural sugar, minerals with zero fat. Coconut water does not contain cholesterol and it is a very good source of calcium, vitamin C and riboflavin. It is also a rich source of magnesium, dietary fibre, manganese and potassium. When you want to know more about coconut water, here are the other health benefits it can provide. 1. It is great for the skin. Coconut water contains some oils from the coconut meat that serve as a natural skin barrier. It also contains cytokinins that can prevent premature aging and wrinkles. People with skin infections can benefit from coconut water’s anti-microbial properties that can promote healing of the skin. 2. Promotes urinary health. Coconut water has been used for promoting urinary health. Being a natural diuretic, coconut water increases urine flow and helps dilute urine so formation of stones are less likely. Coconut water is known for its rich potassium content which helps prevent formation of stones. 3. Great for detox and body cleansing. It is rich in vital nutrients such as vitamins, proteins, carbohydrates and antioxidants in balanced form. This provides great healing of the body. 4. Natural anti-aging drink. Coconut water is considered to be the richest dietary source of cytokinins. Some researchers believe that consuming coconut water may bring anti-aging effects on the body by preventing the development of age-related and degenerative diseases. 5. A rich source of Vitamin B complex. B-vitamins are water soluble nutrients and are necessary as coenzymes for various cellular functions. Deficiency of these vitamins may lead to the development of atherosclerosis and other cardiovascular diseases. 6. They are great laxative. Taking too much of coconut water is for its laxative effect. Consumption of coconut water may be best taken depending on your bowel tolerance and the maximum amount you can drink without getting loose stools. 7. A great source for fibre. Coconut water appears to be a clear liquid, but the wonderful thing about it is its rich fiber content. Fibre helps you feel fuller, which keeps you feel satisfied longer. It is also good for colon health and proper digestion. 8. Remedy for headaches. Headaches are usually triggered by dehydration. 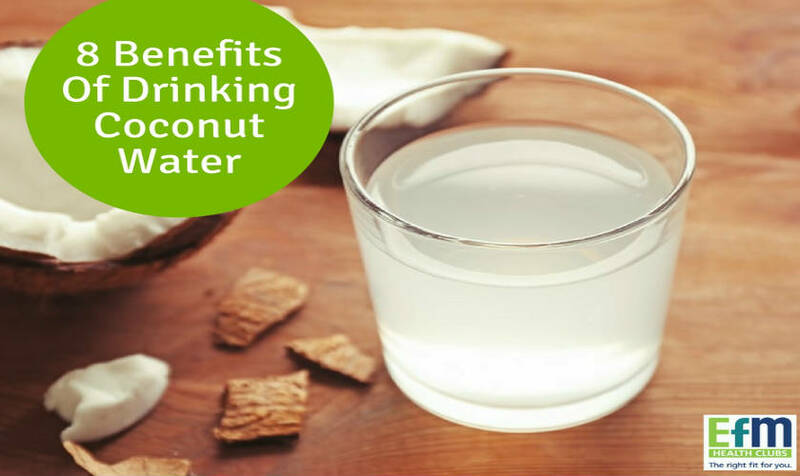 Coconut water can be a great help in providing electrolytes to the body and helping it recover. Furthermore, coconut water is a good source of magnesium. How Do I Lose Fat And Gain Muscle Tone?